Here at Motor Boatin LLC, we deliver our motorboats and Jet Skis to a number of nearby lakes, taking away the stress and hassle of you having to tow your own boat. However, some of our renters choose to tow their motorboats to lakes that are further away or to take a boat on a trip with them. If you are thinking about hitching a boat to the back of your truck or SUV, it is important to know how to do it safely. Driving with a trailer attached can be tricky. It takes a new set of skills and some practice to do it safely. You also need the right tow vehicle that can safely and effectively haul one of our motorboats. If you aren’t sure if you have the vehicle for the job, we can help you make that determination and recommend the size of boat you should tow. Ready your tow vehicle: Fill up your gas tank and check your oil, radiator water level, transmission fluid level and tire inflation. Your vehicle has to work much harder when it is towing, so it is important to give it everything it needs. Weight distribution: The boat must be loaded correctly on the trailer for it to be safe to tow. The center of gravity should be low, and the load needs to be balanced side to side. Check the trailer lights: Make sure that the turn signal, running and brake lights are all working on the trailer. Double-check the connection: There are different sizes of trailer balls, so make sure that the ball on your vehicle matches the coupler on the trailer. Make sure everything is fastened and latched. Make sure the safety chains are connected and that the boat is ratcheted down. Our boat rentals can be fun for the whole family, but it is important to go over the basics of boat safety with your children before setting out on the water. Here at Motor Boatin LLC, we want your whole family to have fun on Falls Lake or one of the other nearby lakes. Safety is key to fun when it comes to boats. When you complete boat rentals with us, we require the completion of an online boat safety course for the person who will be driving the boat, but it is important for everyone on board the boat to know how to keep safe during your boat rentals. Life jackets are required: Being a good swimmer is not enough. Everyone should have a life jacket approved by the U.S. Coast Guard. Life jackets have to fit to work: Have your kids raise their arms above their heads. Their life jacket should not touch their chin or ears if it is tightened properly. Keep warm: It may seem too hot for a jacket or blanket on shore, but always take extra layers for keeping warm on the water. Open water is not like a pool: Lakes have uneven surfaces and currents. Swimming should occur in designated areas only. Diving can be dangerous because you don’t know what’s under the surface. Infants should have their own life jackets and should be held in the boat, not left in a car seat. The car seat would sink immediately if it ever went overboard. CPR training (specifically for children and infants) is a very good idea. When it comes to having fun on the water, supervision of children is key. A trip on one of our fishing boats can be a perfect outing for your family or friends. We can deliver fishing boats to Falls Lake or one of the other nearby lakes. All you have to do is make sure that your NC fishing licenses are current, grab your fishing gear and snacks, and meet us at the lake. Catfish: Channel catfish, flathead catfish and blue catfish are waiting to be caught by you. Crappie: Both white and black crappie are found in the lake. Bass: Largemouth bass and white bass are the species for which Falls Lake is best known. There are also striped bass (also known as stripers) in the area. Perch: Whether you are looking for white perch or yellow perch, you can find them here. Falls Lake is great for fishing boats because it has plenty of sections with trees and stumps in the coves. Most of the time, the water maintains a nice stain, as well, encouraging fish to come closer to the surface than they would if the water was clear. You can sight-fish at times, though. Local fisherman use spinnerbaits, square bill, crankbaits and jigs to fish the shallows here. To complement your fishing boat rental, the area also includes more than 300 campsites, some with RV hookups, along with a marina, nearby lodging, conveniently located stores and even a local bait and tackle shop. The holiday season is coming up and that means people are buying all kinds of gifts for their friends and loved ones. There is a good chance that someone in your life loves fishing or being out on the lake. There are some things that any fishing lover would appreciate. Whether they fish to de-stress or fish as a competitive sport. Tackle box: Anyone who fishes needs a tackle box to keep their lures and hooks neat and orderly. The fisher in your life will greatly appreciate one! There are all kinds of tackle boxes, big and small, to fit everyone’s needs. Fishing pole: A new fishing pole is exciting for anyone who enjoys fishing. There are many poles on the market to choose from whether they’re a beginner or a pro. Fishing line: A fisher is always going to need some fishing line. There are different types of fishing line for the different types of fishing like freshwater or deep-sea fishing. Cooler bag: When going out to the lake or out on the boat to go fishing, there will be a need for drinks and snacks. For those who like to stay out fishing all day, a cooler bag is a great choice for a gift. It keeps drinks cool, so they can fish to their heart’s desire. These are just a few of the gifts that anyone who loves fishing would appreciate this holiday season. If you want to get out on the lake and go fishing, contact Motor-Boatin’ Recreational Boat Rental! Being an active member of the Falls Lake community, our team gets to see the seasons on Falls Lake. We see, once it starts to warm up in the Spring and Summer, boaters, jet skiers and swimmers out on the lake. But, when it cools in the Fall, it’s quiet on Falls Lake which means, we see our fishermen come out. As the owner of Motor-Boatin’, a boat rental company on Falls Lake, I enjoy all seasons and I can rent boats for all times of the year. Right now, we are renting fishing boats in Raleigh more than anything else. Water Temperature: Certain types of fish are more active in certain water temperatures. For example, bass are active in 55 to 65-degree waters which are prevalent in the Fall and Spring. Less Noise: There are so many individuals out on Falls Lake during the warm, summer months that it can make the water noise louder than normal. Fish cannot sense the people noise above the water, but they can sense the boating noises and other noises that are underwater. Less Competition: There are a fewer number of people on Falls Lake in the Fall months. This means there is liking to be less people fishing and less fishermen to compete with. Just because we have hit the Fall months doesn’t mean it is time to head back inside yet. It is still a great time of year to head out to Falls Lake and rent a fishing boat. If you are interested in fishing on Falls Lake, don’t hesitate! Contact our team at Motor-Boatin’ today and learn more about our fishing boats. Pontoon boats are a very popular option when it comes to boat rentals or ownership, and there are some good reasons for this popularity. Pontoon boats are extremely versatile. They can be used for watersports, fishing or just lounging around the lake on a hot summer afternoon. 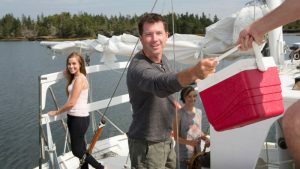 They are perfect for families looking to have an adventure on the water together. Pontoon boats come in all sorts of sizes and shapes, so there’s bound to be a pontoon boat perfect for your activity and needs. Another reason why pontoon boats are popular is because they are relatively easy to drive. They are good boats for beginners to learn how to drive a boat. They handle well at slower speeds and give the driver a good vantage point and view of the water because they sit relatively high off the water for their size. Remember that boats don’t have brakes: This is one of the hardest things for people new to driving boats to remember. It is important to reduce your speed prior to turning and in areas with more traffic because boats don’t have brakes like cars. Watch the wind: Because pontoon boats sit high off the water, they are susceptible to being pushed around a bit by the wind. It is important to factor in the wind as you decide what speed to drive and while you are turning the boat. Turning takes some practice: It is important to speed up smoothly to keep the propeller in the water. If you hear howling sounds, that means the propeller is sucking air. Always look around the boat before beginning a turn and remember that turning will also change the angle of the boat. Let your inner fisherman out for an afternoon! Even if you don’t have your own boat, you can still go out on the water and try to catch some fish on one of our fishing boats. At Motor-Boatin LLC, we rent out fishing boats for use in Raleigh, North Carolina, and we can provide everything you need to have a great day out on the water, including rods, fresh bait, a packed tackle box, and more. Not only are our fishing boats perfect for a solo trip, but they’re also great for family entertainment. 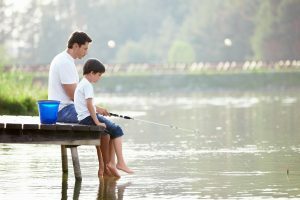 Bring your kids along with you and show them the value of patience as you wait in excitement for that first bite – they’ll love reeling in the catch and spending the day out on the water under the warm sun. For your convenience, we deliver our fishing boats to Falls Lake. If you want to have your boat delivered to another lake — Harris Lake, Jordan Lake, Kerr Lake or another local lake — we can do that with an additional fee. Or, if you want to tow your fishing boat to another lake, you’re welcome to do so yourself without the additional fee. You can rent our fishing boats for one day or multiple days, depending on your plans. To rent one of our fishing boats, you can use our convenient online system or call us directly to make your reservation. Contact us to make your next reservation or if you want more information! Are Pontoon Boats Good for Fishing? Some people will tell you that pontoon boats aren’t a great option for anglers. However, many of the things that make pontoons such a great option for partying and family activities on the water also make them advantageous for fishing. Here are a few reasons why you might want to think about renting pontoon boats for your next day of fishing. 1. Plenty of space. If you like to fish with several fishing rods, a couple of coolers of drinks and snacks, a cooler for the fish you catch, and plenty of lures and other fishing paraphernalia, you’ll appreciate the extra space that pontoon boats offer. 2. More than one size. You don’t have to get a mammoth pontoon if it is just going to be one or two of you going out fishing. There are also smaller ones built for just a couple of people that will still give you elbow room but not have more space than you need. 3. Stability. Struggling with a fish that is determined not to be caught can send a small boat rocking dangerously. Pontoon boats are more stable, so you can keep your balance more easily. 4. Comfort. Larger pontoon boats usually have very comfortable seating, comparable to your sofa cushions at home. Why not have a bit of comfort as you coax the next largemouth bass to its demise? If you want to give pontoon boats a try for fishing before you commit to purchasing one, check out our options here at Motor-Boatin LLC. While there are a few downsides, such as being more challenging to steer and maneuver, we think you might be surprised at how nice it can be to enjoy Falls Lake with one of our pontoon boats. Our online booking makes it easy, and you can call us with any questions you may have. 1. Takes the pressure off. If you paid an initial fee to a boat club and have a monthly fee on top of that, you may start feeling pressure to go use a boat even during months you don’t have the time. Nobody likes to feel their money wasn’t well spent, so you’ll feel stressed when you can’t get out there for one reason or another. With boat rentals, you pay as you go. Can’t get out this month? No problem. No costs involved in staying home. 2. Boat selection may be limited. Boat clubs tend to overstate availability. Not only do they often have fewer types of boats than you might find with boat rentals, but they may also not be there on the days you want them, particularly on holidays and weekends. Booking boat rentals online gives you the chance to see upfront what is available for the time you plan to go out on the water. 3. High costs. Boat clubs are not cheap. You can expect a high buy-in as well as a monthly fee. Unless you will be using boats often and traveling to other parts of the country where a nation-wide boat club would work well for you, going with local boat rentals is going to be your most cost-effective option. If you are looking to enjoy a day on Falls Lake or lakes in the surrounding area, check out the boat rentals here at Motor-Boatin LLC. We offer quality boats of different types, including pontoon, motorboats, and fishing boats. Our online booking is open 24 hours, so you can plan for your next free day you want to spend on the water. Call us if you have any questions. Personal watercrafts came on the scene back in the 1970s with Yamaha waverunners, the first sit-down type, open-stern production, personal watercraft, entering the market in 1986. Since then, they have become a popular option on our nation’s beaches, as well as lakes and other waterways. If you are new to waverunners, here are a few basics you should know. 1. Rent before you buy. It is usually better to learn how to operate something new by renting one before investing in one. This gives you the opportunity to see if you like it enough to own one yourself. You can also rent different types so you’ll learn which you prefer. 2. Learn the safety measures. There are two very important safety measures you should know. The first is that you should always wear a life jacket. Even if you are an excellent swimmer, a life jacket could save your life if you were to be rendered unconscious in an accident. The second is to use the engine shut-off clip safety feature. That way, if you fall off, the engine instantly shuts down. This keeps you safe, as well as others in the area. 3. Start slow. You should always start at slow speeds as you learn how waverunners move on the water and how to safely manage turning. Take time to see how the watercraft maneuvers before going full-throttle. It is best to learn while close to shore. Once you feel confident, head out to deeper waters and slowly increase speed. Waverunners hop off waves at higher speeds, so lift your buttocks a couple inches off the seat when you feel it lift for a more comfortable ride. If you are interested in renting waverunners, sea-doos or jet skis, check out our selection at Motor-Boatin LLC. Our online booking is available 24 hours a day. We also rent pontoon boats, fishing boats, and motorboats. Get out and enjoy all that Falls Lake has to offer and create life-long memories!